Struck by a pitch in the facemask, HP Umpire Tom Hallion was able to remain in Wednesday's Rangers-Twins game. With none out and one on in the top of the 2nd inning, Rangers batter Elvis Andrus took a 1-1 fastball from Twins pitcher Ervin Santana for a ball. Replays indicate the 91 mph pitch struck Hallion on the lower left jaw/ear portion of his traditional-style Wilson mask. 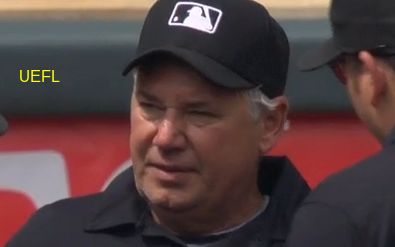 After attention from Twins training staff and discussion with other umpires, Hallion remained in the game.